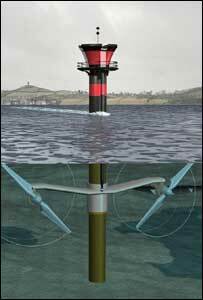 A plan to produce electricity from a tidal turbine installed near the mouth of Strangford Lough has been delayed. Seagen, the world's first commercial scale tidal turbine, began supplying a small amount of electricity to the National Grid last Thursday. But a programming fault led to damage to one of the blades the next day. Seagen sits 400m offshore between Strangford and Portaferry to take advantage of strong tidal forces. It was installed in May and the plan was that it would be fully operational by the end of the summer. By then the firm owning it, Marine Current Turbines said it would generate 1.2 Mega Watts of electricity. Last Thursday, it supplied a smaller test amount of power to the grid. On Friday, a blade was damaged and replacement blades are being sought from the firm which made them.